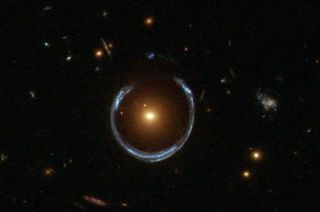 The Hubble Space Telescope captured the gravitational lens from galaxy LRG 3-757. A new study validates Einstein's theory of general relativity in a distant galaxy for the first time. This study supports our current understanding of gravity and provides more evidence for the existence of dark matter and dark energy — two mysterious concepts that scientists know about only indirectly by observing their effects on cosmic objects. Since the theory was first published, it has been tested a number of times within our solar system. But this new study, conducted by an international team of astronomers led by Thomas Collett of the Institute of Cosmology and Gravitation at the University of Portsmouth in the U.K., is the first precise test of general relativity on a large astronomical scale, the researchers said. Using data from NASA's Hubble Space Telescope and the European Southern Observatory's Very Large Telescope in Chile, the research team found that gravity behaves the same way in a faraway galaxy as it does in our solar system — just as Einstein's theory predicts. The researchers tested the assumption that "the same laws of physics we see working here on Earth are true anywhere else," Terry Oswalt, an astronomer and chair of physical sciences at Embry-Riddle Aeronautical University in Florida, said in an email to Space.com. Verifying general relativity "at all possible scales (especially the largest scale) is fundamentally important to physics as a whole, and to cosmology in particular," added Oswalt, who was not involved in the new study. Dark matter appears to be spread across the cosmos in a network-like pattern, with galaxy clusters forming at the nodes where fibers intersect. By verifying that gravity acts the same both inside and outside our solar system, researchers provide additional evidence for the existence of dark matter and dark energy. In validating general relativity, the findings also serve as additional evidence for the existence of dark matter and dark energy, Collett told Space.com. Dark matter and dark energy are two of the "weird things" that exist in the standard model of cosmology, Collett said. The standard model is a theory which describes how fundamental forces and particles in the universe work and behave together, and it aims to explain our observations and experiments. However, our lack of understanding and explanation of dark matter and dark energy, "the two biggest mysteries in cosmology today," according to Oswalt, lead some to question the standard model. "I doubt astronomers will be giving up the standard model of cosmology anytime soon," Oswalt said. So, instead of abandoning the standard model, researchers look to "make the models more precisely explain the observed data," he added. In the standard model, dark matter is required to explain how fast stars orbit around galaxies and dark energy is required to explain why the universe is expanding faster, according to Collett. Some scientists have suggested that "alternative gravity theories," as Collett described, could eliminate a need for dark matter and dark energy in the standard model. However, because this team has found that gravity functions outside our solar system like it does inside our solar system, for now it appears that our understanding of gravity is correct and dark matter and dark energy still fit in the standard model. Collett noted that this study isn't concrete "proof" of dark matter and dark energy, but it serves as additional evidence that they exist. Six different images from the Hubble Space Telescope have been magnified by a cosmic effect called gravitational lensing. The images were taken in infrared light by Hubble's Wide Field Camera 3. Color has been added to highlight details in the galaxies. To validate general relativity outside our solar system for the first time, the research team used strong gravitational lensing, a technique in which a massive object — in this case, a galaxy — acts like a huge lens by bending light so much that the image of a background object, also a galaxy, is distorted. This team of astronomers used the galaxy ESO 325-G004 because it's one of the closest lenses to Earth, only about 500 million light-years away. If the two objects are well aligned, this effect creates a ring of images, known as an "Einstein ring," of the background galaxy. The radius of this ring "is proportional to the deflection of the light," Collett said, "so if you measure the radius of the ring, you can measure the curvature [of space-time]." In addition to measuring the space-time curve, the researchers had to determine the galaxy's mass, because general relativity predicts how much curvature is created by a mass. They calculated this mass by measuring how fast the galaxy's stars travel. Then, by comparing this measured mass with the measured curvature of space-time, the team found what general relativity predicts for this mass, or galaxy. So now, as far as we know, even outside our solar system, general relativity is the correct theory of gravity, Collett said. This team of astronomers hopes to study even farther galaxies and lenses, further verifying that gravity works the same throughout the cosmos. "It is so satisfying to use the best telescopes in the world to challenge Einstein, only to find out how right he was," team member Bob Nichol, director of the Institute of Cosmology and Gravitation, said in a statement. The work is published today (June 21) in the journal Science.